Last week I went to the Obamas Portraits Unveiling and wrote about it for ARTnews. 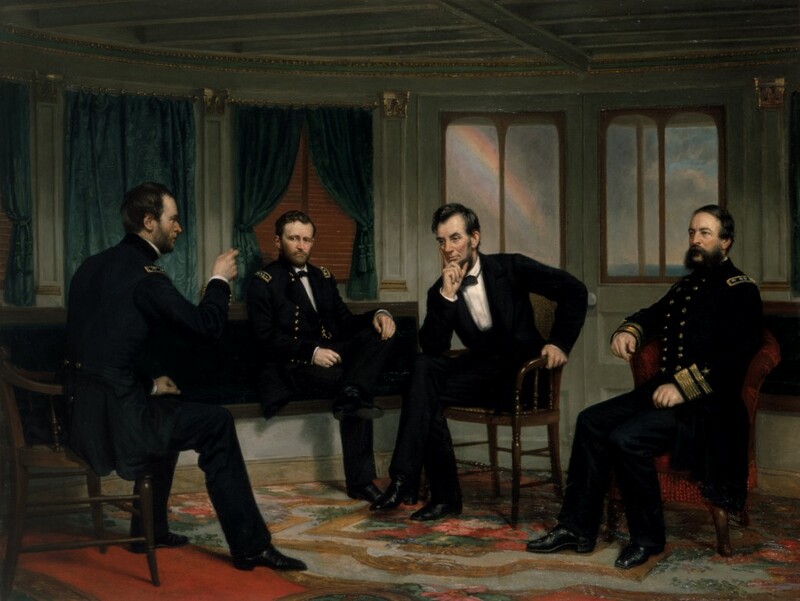 What I wasn’t able to conclude was what low-key obsessed me the most from the moment I left the National Portrait Gallery: what is up with that chair? 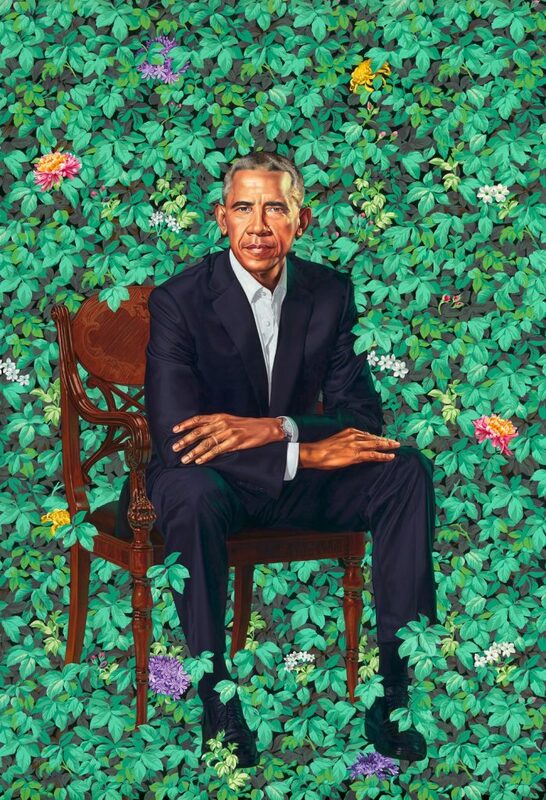 I’m off the sauce now, but there was a time in my life where I was pretty deeply interested in American antique furniture, and so the significance of the chair Kehinde Wiley depicted President Obama sitting in felt like a story waiting to be told. Because no one mentioned it at the National Portrait Gallery event; I didn’t think to ask him about it until later; and none of the hottest takes I’ve seen have really taken up the subject. The details: an armchair with curved arms, with scroll ends that don’t reach the seat but have some kind of support, sometimes called an elbow chair. 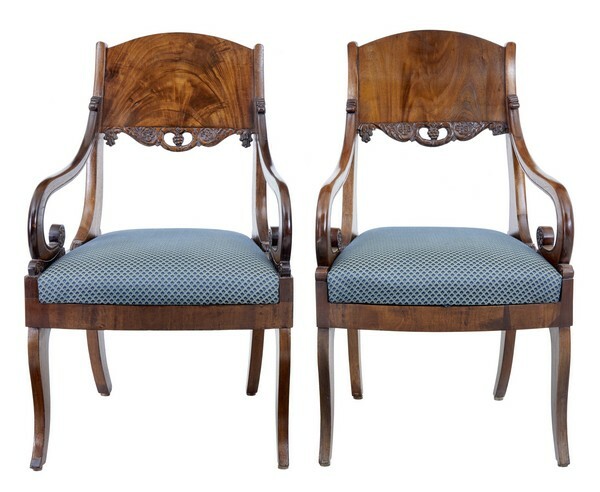 The arms are reeded, aka, they have grooves along the top. The skirt appears to have an inlaid pattern. The front legs are turned on a lathe. The back has both an oval top, which is either inlaid or carved, and a pierced splat below. All of this indicates a fine wood, either rosewood or mahogany. There are elements of Regency style, common in the 1800-10s or so, but most of the similar examples are from England. The round back feels like much later 19th century, though, and one super-savvy designer friend I asked suggested it was an 1870-80s American interpretation of earlier, Regency style. 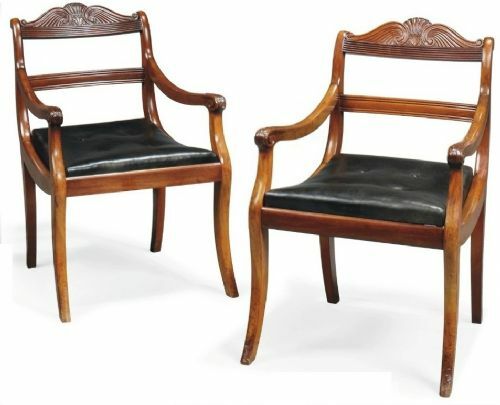 I asked decorative arts curators, and an antique dealer, who all felt the chair was unusual, even odd, but no one could identify it or explain its significance. It felt like conceding defeat to ask the artist for the answer, which I did, two days later, via the NPG’s press office, since it’s their painting now. Word came back, but no detail: Wiley had created the chair. It is an imaginary synthesis of design details for which there is no explanation. At least it’s not me, I thought. And I wondered whether this fixation on decoding stylistic quirks, the foundation of antique connoisseurship, was a foreign language of exclusion and privilege (yeah), and whether that came to bear. Or maybe the point of the chair was simply visual, aesthetic, a requirement for how it functioned in the painting in terms of pattern, form and design (maybe). The flowers may transmit a coded signal, but the ornate particulars of the chair are noise.